A wormhole – a tunnel that connects two distant region in space by creating a shortcut through the spacetime – is thought as the only viable way to visit far away worlds and galaxies. Otherwise, you’re stuck with traveling at the speed of light which, considering the vastness of interstellar space, is arduously slow. While for all practical reasons gravitational wormholes remain a staple of science fiction, the same can’t be said about magnetic wormholes which were demonstrated for the first time by a group of Spanish physicists. (Left) 3-D diagram of the magnetic wormhole shows how the magnetic field lines (in red) leaves a magnet on the right pass through the wormhole. (Right) In terms of magnetism the wormhole is undetectable, which means that the magnetic field seems to disappear on the right only to reappear on the left in the form of a magnetic monopole. Image: (Left) 3-D diagram of the magnetic wormhole shows how the magnetic field lines (in red) leaves a magnet on the right pass through the wormhole. (Right) In terms of magnetism the wormhole is undetectable, which means that the magnetic field seems to disappear on the right only to reappear on the left in the form of a magnetic monopole. Exploiting advances in metamaterials and invisibility, scientsits at the Department of Physics at the Universitat Autònoma de Barcelona connected two regions of space magnetically. Basically, one magnetic field was transferred from its source to another end of the magnetic wormhole without any sign of anything crossing in between. The researchers built on previous work they did last year when they directed a magnetic field from one end to the other. This wasn’t a genuine magnetic wormhole, though, since the field was still visible or detectable while traveling through the tunnel. 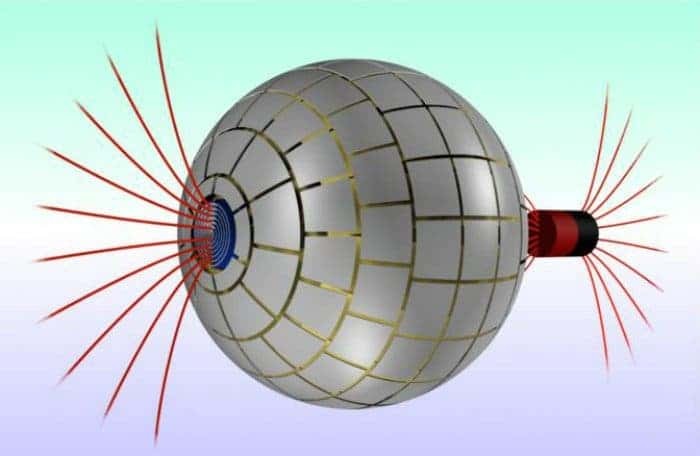 The current wormhole consists of a sphere made of different layers: an external layer with a ferromagnetic surface, a second inner layer, made of superconducting material, and a ferromagnetic sheet rolled into a cylinder that crosses the sphere from one end to the other. Practically, there’s no way to detect what goes inside the sphere. When a magnetic field from a source, such as a magnet or a an electromagnet, crosses to the other end of the wormhole, it appears as if the source is a magnetic monopole – a magnet with one pole. These monopoles do not exist in nature. In doing so, this experimental setup appears or gives the illusion that the magnetic field travels from one point to the other through an extra dimension outside the conventional 3D space. Make no mistake: this is a three-dimensional device. It’s just that it’s undetectable by any magnetic field. There could be some uses for magnetic wormholes. Patients undergoing MRIs, for instance, could sit more comfortably as the machine scans their bodies since there wouldn’t be a need to keep the detector so close. The MRI could also image multiple body parts simultaneously which could prove very useful in some instances. What’s interesting is that while the magnetic version isn’t nearly as spectacular as the gravitational one, the two wormholes are basically analogous. It “changes the topology of space, as if the inner region has been magnetically erased from space”, explains Àlvar Sánchez, the lead researcher.